Toll -Like Receptor (TLR) Signaling | Signaling Pathways | BioVision, Inc.
Toll-like receptors (TLRs) are single, membrane-spanning, non-catalytic receptors that recognize structurally conserved molecules derived from microbes and key proteins of the innate immune system. Mammalian TLRs include both intracellular and extracellular receptors that recognize microbial proteins, nucleic acids, carbohydrates, and lipids to activate host defense mechanisms. TLR4 is a cell surface, transmembrane protein that primarily recognizes bacterial lipopolysaccharides while at sufficiently high concentrations, endogenous lipids can also be recognized by TLR4. A pivotal study demonstrated that mice with a loss-of-function mutation in TLR4 resist becoming obese on a high-fat diet. Hence, TLR4 inactivation may protect against high fat diet-induced insulin resistance. TLR4 is expressed on macrophages, which are recruited by inflammatory cytokines in tissues such as obese adipose tissue. In humans, recent studies show that TLR4 expression is upregulated in muscle or adipose tissue from obese or type II diabetic subjects, and this increase correlates with insulin resistance. 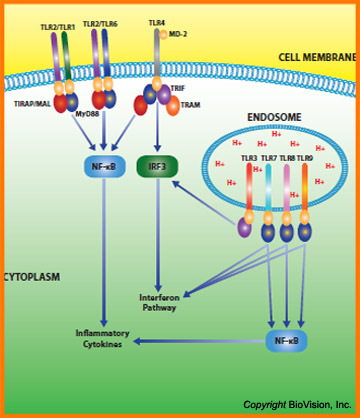 In addition, there is an increase in TLR4-mediated NF-kB activation (which resulted in the production of proinflammatory cytokines interleukin-6 and TNFa). NF-κB activation and insulin resistance may be causally related since the palmitate-induced insulin resistance in cultured skeletal muscle cells can be prevented by blocking NF-κB activation. Interestingly, in contrast to saturated fatty acids (SFAs), mono­unsaturated fatty acids such as olein, which is enriched in olive oil, appear to neutralize the effects of palmitate and thus have a positive rather than a negative effect. Exercise also has a positive effect, downregulating the expression of TLR4 and decreasing palmitate accumulation in human muscle. Studies have also demonstrated a link between stearoyl-CoA desaturase 1 and TLR4. The accumulation of SFAs in the body is tightly regulated by stearoyl-CoA desaturase 1, an enzyme that converts endogenous SFA to monounsaturated fatty acids and its genetic deletion or inhibition promotes inflammation, TLR4 hypersensitivity, and accelerated atherosclerosis. Therefore, stearoyl-CoA desaturase 1 may play an unexpected role in suppressing inflammation by preventing excessive accumulation of endogenous SFA-derived TLR4 agonists. In parallel, laboratories have demonstrated that TLR4 is necessary for dietary SFAs to induce obesity, insulin resistance, and vascular inflammation in rodent models. Additionally, TLRs also signal through lipid rafts, which are an important site of ceramide release. Ceramide is a critical part of the sphingomyelin stress signally pathway and is associated with the development of insulin resistance.